Digital convergence is a trend that enables the video clips stored in PC contents to be stream to TV screen. There could be already solutions in the market but most of them are priced so high that none are affordable and worth spending for beginners. Of course, prices are paid for high end features such as wireless streaming that appears in Apple TV or Xbox 360. But if you don’t care about wireless technology but just keen on getting your video stored in your PC contents to be viewed on your big TV screen, this could be a good solution for you. Sandisk has just unveiled a new Sansa Take TV targeted for entry level market when price is a great concern. Sansa Take TV comes with famous AV (Audio Video) interfaces such as S-Video, Composite Video and Analog Stereo. It is almost compatible with the entire current consumer electronics product in the market. One drawback, it doesn’t have the HDMI (High Density multimedia Interface) since it doesn’t support HD (High Definition) resolution on video display. Some of the video formats supported are MPEG4, DivX and xVid and etc which could be sufficient in view of many free video format converter in the market. 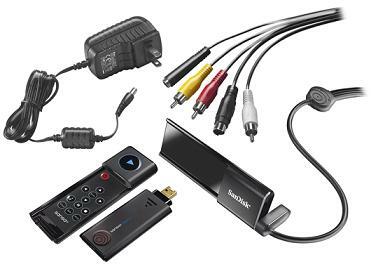 The full kit comes with the video player, docking station, power adapter, remote control and AV cables. There are two models – 4GB and 10GB capacity for consumers’ selection. Priced at priced only $99.99 and $149.99 respectively, I am sure this is a good deal for beginner that would like to switch its PC contents to big TV screen.